Khao Noodle Shop shows evolution of Old East Dallas neighborhood is not gentrification. Many Vietnamese refugees and southeastern Asians landed in Old East Dallas in the 1970s. 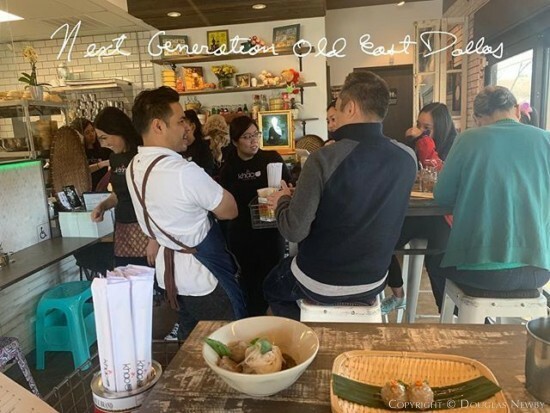 Vietnamese and Asian restaurants, grocery stores and gardens sprung up around Bryan and Fitzhugh where many of these Asian immigrants found housing in the surrounding deteriorated neighborhood. Over 40 years the neighborhood has improved. Divided up rent houses have returned to single-family homes, historic districts have been created, apartment complexes have gradually improved. The mainstays of Bryan and Fitzhugh like Jimmy’s Italian Food Store and Mai’s restaurant have remained. Urbano and other longtime restaurants also continue to line the streets. What is particularly heartening is Donny Sirisavath’s opening of Khao Noodle Shop serving Laotian food from his mother’s recipes who came to Dallas in the early 1980s. Rather than Asian restaurants being gentrified, they have been added to and upgraded. At Khao, you will see Laotians, East Dallas residents, and hipsters. The outdoor community tables included wine retailer, restaurant owner, wine distributor eating lunch. Sure, over 45 years a neighborhood evolves, but gentrification is misunderstood. A neighborhood can gently evolve over a half century and still have the character, vibe, and many of the same people, just not as much crime, disease, transience, murders, and prostitution as the neighborhood once had. "Devoted to you and your home since 1976."